Long known for performing commissioned works, PRISM Quartet release a double album of original material. It is staggeringly wonderful. The PRISM Quartet is a saxophone quartet led by Matthew Levy. Over the years, Levy and his band mates -- Timothy McAllister, Zachary Shemon and Taimur Sullivan -- have commissioned many modern compositions for them to perform. After all, the repertoire for soprano, alto, tenor and bass saxophones is probably pretty limited despite the relative successes of the World Saxophone Quartet and the 774th Street Quartet. Their double album People's Emergency Center showcases original work by Levy himself. Writer John Schaefer gives Levy quite the hand-slapping in his portion of the liner notes: "But while championing so many of his colleagues, from the internationally renowned to the young and emergent, Levy has done a great disservice to a contemporary American composer with a distinctive voice: namely, Matthew Levy." Yeesh! It only takes one listen to People's Emergency Center to understand from where Schaefer is coming. First of all, this 88-minute album does not lean on a stylistic center. When you pop one of the discs into your computer, whatever software you use will identify the music as "jazz". In truth, jazz is just part of the picture here. Levy's compositions sail far into contemporary classical territory too, leaving room for the occasional drone or world music influence. And even within the "jazz" label these songs don't stick to just one subgenre. There's the blanket term "post-bop" at work, things with a little more traditional swing to it, and some far out modern jazz as well. The other thing that makes People's Emergency Center so special is the guest list. Former member Tim Ries returns to contribute soprano sax and rising jazz star Rudresh Mahanthappa provides some alto. The inimitable Jason Moran plays the piano, Richard Belcastro covers the sitar, Ben Monder does the guitar thing and Jay Anderson, Bill Stewart and François Zayas round out the rhythm section on bass, drums and percussion respectively. You can't enlist help like that and expect everyone involved to just sleepwalk their way through some anonymous jazz session. The album's first disc is debatably the more exploratory of the two. It has two selections from Levy's score for the documentary Been There. This is where you'll find the 13-minute title track dedicated to an neighborhood organization in Levy's hometown of Philadelphia. The music is too abstract to be called jazz yet too boppy to be referred to as anything else. "Gymnopedie", riffing off of Erik Satie's made-up term, justify the 20th century claim that jazz was "America's classical" music. "Lyric", which runs longer than fifteen minutes, could fool the lay listener into thinking it was a Stravinsky piece. It's on the second disc where Levy puts the swing back into his group with the 12-minute "Refraction", another odd yet snappy piece of music that probably doesn't rely on the tired old chart method. "Brown Eyes" sounds like a band winding down the after party after a wild night at the Cotton Club. After that comes doo-wop with "Mr. Bobs and Lori Ann" with a smooth performance by Ries. Serious compositions often tell stories. On People's Emergency Center the individual tracks don't tell stories so much as they act out 12 independent novels. All you need is one listen to the cyclical, sometimes minimal opening track "Awakening" to know that a) this will be a most unusual album and b) it's going to be quite remarkable too. 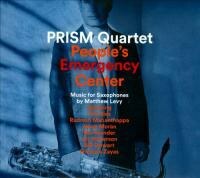 No matter what style you nail the PRISM Quartet and People's Emergency Center to, this album should go down not only as one of 2014's finest releases but also as one of the most unforgettable works of chamber music for years to come.